I have been a bit disappointed with my HB in one tire. The liquid evaporates WAY too fast in my rear tire compared to my front. I am not sure if it is not sealing/seating correctly or what, but there is a lot of seepage at the bead. I am going to remove the tape and reapply... I suspect it was a bad tape job at the shop that built my wheel (who also laced it 2x instead of 3x). ^ IME tape has been the culprit for sealant disappearing. Velocity rim tape caused me problems. Once replaced with 3M, it Stan's all was good. Split tube ghetto tubeless FTW! The wheel is taped with Stan's, but I didn't do the tape job and it wasn't as neat/clean as my front wheel. I am gong to air the wheel up tomorrow and tank it. The tire seeped through the sidewalls at first, but there is still considerable amount of wet at the bead. 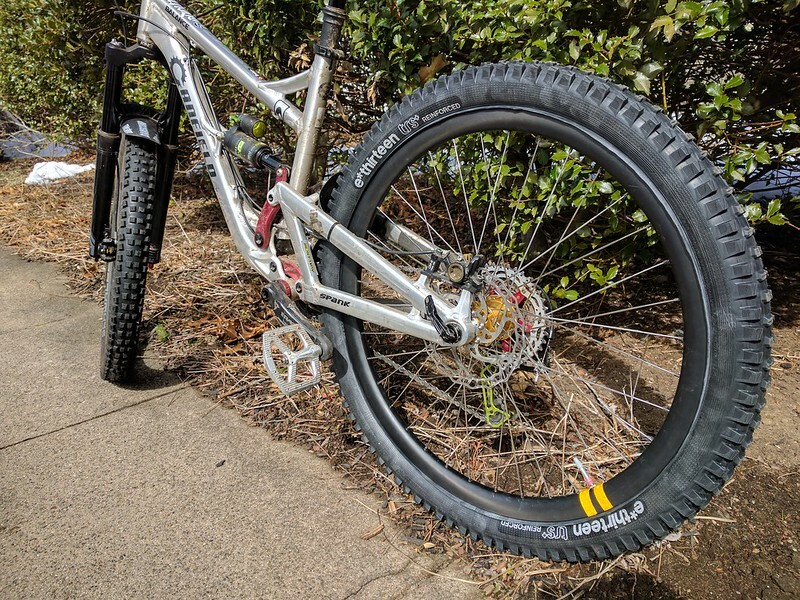 The rear tire is a Forte Tsali (not tubeless), but I ran a Pisgah 1 (not tubeless) on the front with no problems (until I tore the sidewall open on the trail and swapped it for a Pisgah 2 tubeless). I really like the grip/ride of the tire, but I would rather go to a different tire to fix this problem. Put air in the tire (it was 100% flat) and put it in a large thing of water..... yeeah... it's the tire. So much air leaking from the sidewalls that the water looked like it had fine fizzy bubbles (campaign?) in it. The tire has had at LEAST 16 ounces of HB poured into it. The sealant was still a gel (most of the liquid had escaped through the sidewalls), but there was no sealing the leaky tire up. Took the tire off and put my 2.3" old Spec Ground Control on. It was a pain to get to seat (it has been hanging for a while), but once seated and sealant added.... nothing... not one single bubble. I will replace the tire with a different tire at some point in the future. I REALLY liked the Tsali's profile and grip, but it's too bad they have not made a tubeless version of it. ^ Curious, what are you using for chunk? Just the basic recipe. Glitter and the Slime. It does a great job sealing punctures, but the sealant never dries inside the tire. When I used Stan's sealant, it formed a skin on the inside of the tire over time, but it dried out really fast too. I would rather buy true tubeless tires and not have to refill the sealant as often. I did put the Tasli and other Ground Control on my commuter bike today to take it out for a spin on the dirt, so all is not lost on the Tasli tire. Next batch is coming soon. Chunkage is the goal. This is one of two. Anyone else here doing any DIY? DIY watchmaking at the moment. Closest to DIY bike stuff lately, was mixing a fresh batch of dry lube. oooh! You got any pictures of your watches or movements? A hydro-mechanic movement, which is under construction, hopefully done by the end of this year. A few watches, mostly based on components sourced from other manufacturers, but with my own parts thrown in here and there. All going to be much more interesting in a month or two. The latest part: a 0.3mm linear guide for a valve. Pretty much a 0.3mm rod, and an outer guide that's 0.3mm inside, 0.5mm outside diameter. All fitted within 0.002mm to make it work. See pic. ........no, European matches are not bigger than the ones you usually use. Just received a couple of base movements as well, to be used for future projects. Very nice! I wear mostly European watches, from a guy in Portugal who runs his micro-brand called Prometheus watch company. My other mechanical watches are of the Seiko/Orient variety. Since today we're beating on dead animals.. Wondering if I'm alone on the quest for a better Homebrew Sealant. Does the kitty herd now run cush core, Vittoria, or other foam inserts? I need to mix something up as the Berryman's weeps a lot when the temps change. It also doesn't seem to leave a coating on the inside of the tire. Took the beads loose since I figured there was a dried glob of sealant inside to remove. Inside was as clean as a new tire. Still have about a half gallon left. I should take a couple of containers and see how it mixes with the mold builder and other additives. I will say it could use something to make it more clingy. I currently run on a mix of 1:1 Stans and latex milk. It was primarily to be able to use it for high pressure tires, but it also seals pinholes. I have a set of the Vittoria inserts. Bought them with my employee discount before the shop I worked at closed. Haven't installed them yet since I am not sure if they should go on the 26" DH bike or the ride everywhere else bike that has 27.5" wheels. Please keep us posted. The Vittoria's look interesting, as a solution to rear pinch flats. Nothing worse than flatting, ruining a rim, and having to HAB. As a stubborn Norwegian I'm still on a voyage to better the original sealant. It's no longer about saving $, it's about performance, and DIY pride. To plug bigger holes, I'm using different chunkage, and have modified the mix to reduce separation. Once field tested, I'll post results.